Book Today, We'll Plant a Tree: Tree Planting Initiative is Back! Spring is Here, and Ecosparkle’s Green Clean Tree Planting Initiative is Back until September 1st! At Ecosparkle, we believe that every window deserves a view to a cleaner, greener tomorrow. That’s why, in the Spring of 2015 we made a promise to our customers: to plant one tree for every new Green Window Cleaning Service booked by the end of the Summer. We made good on that promise. We partnered with the Lake Simcoe Conservation Authority, donating a $2200 cheque and planting 150 trees and shrubs right here in Newmarket Ontario. 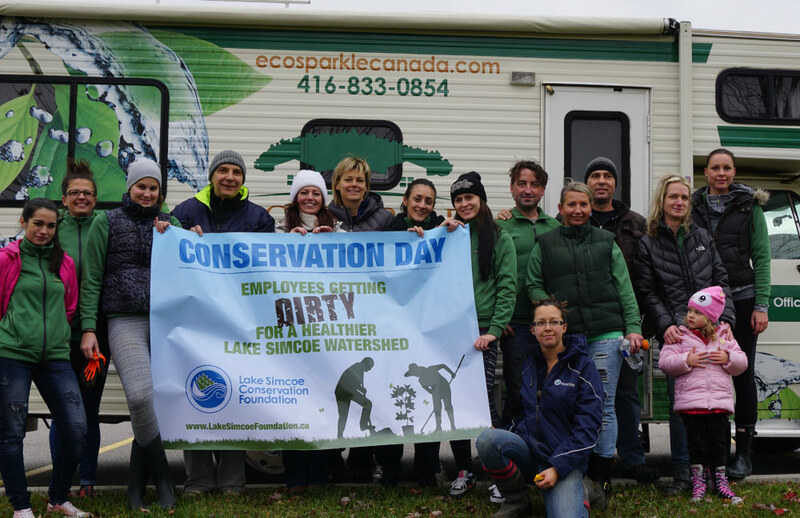 You can view a video recap of the Ecosparkle team on last year’s tree planting day by clicking HERE. It was an incredible event, made possible by the support of our incredible customers – and an amazing moment for our team. That’s why we’ve decided to bring our Green Clean Tree Planting Initiative back again for 2016! Starting April 2nd, and running through September 1st, 2016, Ecosparkle will plant one tree or shrub in a targeted area (identified by the Lake Simcoe Conservation Authority as an area in need) for every Green Home or Window Cleaning Service booked with Ecosparkle*. Planting day will happen in the fall, which helps ensure a high survival rate for the new saplings. We’ll capture the event on film, and post a video recap of the event soon after! Ecosparkle knows that a healthy community depends on a healthy environment. That’s why we only use natural and organic, plant-based green cleaners during every home, window and office cleaning we share with our customers. We invite you to discover our Green Clean by booking your FREE estimate. On top of our tree planting initiative, we’re also giving away some incredible prizes – including 2 Marin Bobcat 9.5 mountain bikes valued at over $1000 – so don’t miss your chance to make your change and win big at the same time! We look forward to sharing our Green Clean with you!